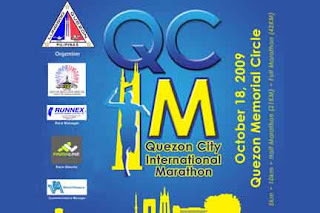 I finished my 2nd half marathon yesterday (Sunday) at QCIM. The goal was just to finish as I have been in sick bay for the past 3 weeks. 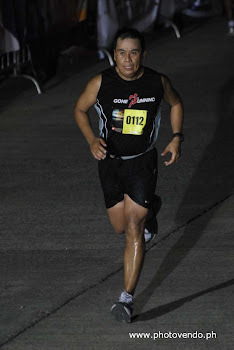 As some readers might be aware, I have been nursing my ITBS injury which I got after my 1st half marathon at the Ayala Eco Dash. I have been contemplating days before the event if I should quit this event or continue and finish what I aimed for. I have registered for this event 2-3 weeks ago and was hoping that my injury would get better. Indeed I was feeling better last saturday, but was having second thoughts since I have not gained enough mileage. however, I have all the positive forces within me so it was a go for me! At the starting line, I saw pacers with balloons from Takbo.ph group. It was cool as it would make the race exciting since these groups will help boost the morale of runners. I saw Neil (crashnburn) a friend from takbo.ph, who was pacing for 2:45 and told myself that I should at least end up with his group at finish line. I am running with fellow Gone Running members, Cherry (her first official 21k race) and Kuya Ernie, but told them that they can go ahead as I would be on a test mode and will run very slow. As soon as I said it, they took off just like that and left me running alone. Suddenly, I saw a familiar face (a co-blogger) who was running at my side, it was Argonaut, I introduced myself and he asked me of my target time, I simply said, “I just wanted to finish this with no injury”. He was catching up with the 2:30 pace group and invited me to join. At km 4, I catched up with the group and hanged in there for awhile. I met Gab, Marian, and Ebong (or Edong). The whole time, my focus was my knee, was conscious that pain will start to come out anytime soon. I was comfortably pacing with the 2:30 group and did not even notice the distance as I keep on worrying about my knee. At km 8, I was feeling small pains already and got worried that I might not finish the race. Though being an optimist, I knew that reality would step in and I will have to struggle anytime soon. At km 10, met up with Argo again and told him that my knee was starting to hurt, he advised me to slow down and take it easy. By this time, the pacers were already far beyond my reach, it was difficult for me to catch up and decided to ran my own pace so that I can finish the race. At km 15, I started to slow down, was stretching my legs and felt embarassed since I knew that I will be walking anytime soon which I did at km 16. From then on, I figured that the 2:45 pacers (Neil's group) will catch up with me in no time. I had to motivate myself and targeted to at least finish with Neil's group. At km 19, I tried to jog but pain was unbearable and forced me to still walk. At km 20, the 2:45 pacers were slowly catching up on me, tried to jog, for 200m, walk another 200, and by this time, the group catched up on me. Neil gave me a push and told me that we will finish soon. I got motivated and started to jog and surprisingly I was able to reach the finish line not walking (at least it saves me from further embarassment). The group went ahead of me and I finished at 2:46:11 (unofficial time), 12 minutes slower than my previous 21k. I know, it was foolish of me to even try to run knowing that I was not fully recovered from my ITBS injury. I felt that I was better and ready to take on this challenge. I had no worries on my cardio as I was doing my cross training using my bike and was confident that I can make it. Looking back, aside from running with less mileage and coming from an injury, there were some things that I did wrong. 1. Lost Focus - my goal was just to finish with no injury and beating my first 21k was out of the equation. I told myself that I will ran at 7:30-8:00/km and hopefully finish without an injury. But I ended up averaging at 7:05/km in the last 13km and I even ran at 6:35 at km 13. I got motivated by the 2:30 pacers and for awhile there I thought I can PR in this race. Patience really is key and never be tempted everytime you feel that you can make it. Stick to the plan. 2. Long stride - I normally have a long stride, I learned that having a shorter stride and faster cadence is better (isnt it?). Longer stride creates more impact and shins and knee are at risk of getting injured. Well, I have to learn from this again. This will not stop me from getting better next time. I continue to log my running experience and hopefully I get to write a more dignified story about my run. Oh! by the way, I think what I have now is shin splints and not ITBS. It took guts to say the least to finish the race the way you did. But please rest so you can run more 21k races (and full marathons) in the future!